ADP/ATP Ratio Assay Kit (Bioluminescent) ab65313 is based on the bioluminescent detection of ADP and ATP levels. It can be used for a rapid screening of apoptosis, necrosis, growth arrest, and cell proliferation simultaneously in mammalian cells. In the ADP/ATP assay protocol, luciferase catalyzes the conversion of ATP and luciferin to light, which in turn can be measured using a luminometer or Beta Counter. The ADP level is measured by its conversion to ATP that is subsequently detected using the same reaction. The assay can be fully automatic for high throughput and is highly sensitive (detects 100 mammalian cells/well). Changes in the ADP/ATP ratio have been used to differentiate the different modes of cell death and viability. Increased levels of ATP and decreased levels of ADP have been recognized in proliferating cells. 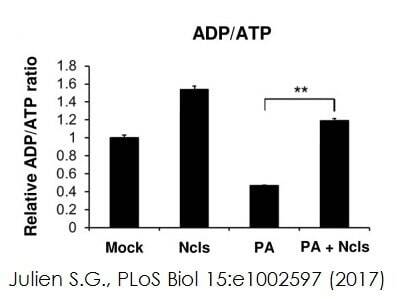 In contrast, decreased levels of ATP and increased levels of ADP are recognized in apoptotic cells. The decrease in ATP and increase in ADP are much more pronounced in necrosis than apoptosis. Review the cell health assay guide to learn about kits to perform a cell viability assay, cytotoxicity assay and cell proliferation assay. Review the metabolism assay guide to learn about assays for metabolites, metabolic enzymes, mitochondrial function, and oxidative stress, and also about how to assay metabolic function in live cells using your plate reader. The changes in ADP/ATP ratio have been used to differentiate the different modes of cell death and viability. Increased levels of ATP and decreased levels of ADP have been recognized in proliferating cells. 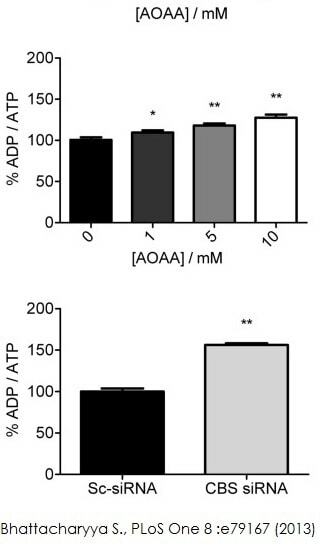 In contrast, decreased levels of ATP and increased levels of ADP are recognized in apoptotic cells. The decrease in ATP and increase in ADP are much more pronounced in necrosis than apoptosis. 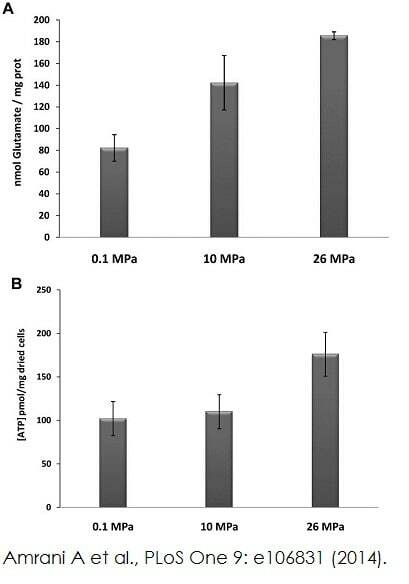 Quantitation of glutamate levels (A) using ab138883 and intracellular ATP (B) using ab65313 in D. hydrothermalis cells grown under different pressure conditions. ADP/ATP ratio in cystathionine-beta-synthase slienced A2780 (Ovarian cancer cell line) cells and AOAA (aminooxyacetic acid) treated A2780 cells were measured using ADP/ATP ratio assay kit (ab65313). Functional studies - ab65313Image from Julien S.G., PLoS Biol 15(2), Fig 8C. doi: 10.1371/journal.pbio.1002597. ADP/ATP ratio were examined in both narciclasine (ncls) and vehicle (veh) treated C2C12 myotubes with or without PA treatment using ADP/ATP ratio assay kit (ab65313). We tested ab65313 ADP/ATP Ratio Assay in M. tuberculosis (Mtb) strains H37Rv and 18b. The main goal was to determine if the Nucelotide Releasing Buffer (NRB) was able to cause release of nucleotides from Mtb with or without additional disruption (bead beating). Cells: Mtb strains H37Rv and 18b were grown in 7H9 media and harvested at an OD600 of ~0.4. 175 Million total bacteria were used from each strain. ATP disodium salt (ab120385) dilutions to create a standard curve. Boxplot of ADP and ATP concentrations on two technical replicates on each of two biological replicates. #N.B. The gain setting on the luminometer resulted in ADP readings (Data D of the kit) for the bead-beating groups that were off-scale and thus non-quantifiable, but still plotted in the attached figure. NRB alone did not lead to appreciable release of nucleotides from two strains of Mtb. The addition of bead beating to NRB led to significant increases in measured concentrations of both nucleotides in both strains. I would like to use ab65313 kit on drug treated cells next week. I am requested to represent my results per mg protein. Does the buffer in which i lyes the cells (the nucleotide releasing buffer) allow performing a bradford assay (I use a sigma kit) after the luminescence reading? Otherwise, would it allow reading hoechst fluorescence after the fact? The assay buffer has high concentration of detergent-hence Bradford assay is not recommended. We advise using the BCA assay for protein measurement when using this kit. This assay is performed on cell lysates, so it would be difficult to label the cells with Hoechst after the assay. Why is data C required after data B acquisition? Why is it required to wait a few hours in step 3? What is the best sample preparation protocol for pancreatic islet cells? 1. Why is data C required after data B acquisition? The two readings should be similar and perhaps data C is not necessary but the ATP signal may go down slightly while the ADP converting enzyme is prepared. 2. Why wait a few hours after adding the ATP Monitoring Enzyme and Nucleotide Releasing Buffer to the wells and before reading data A? There may be bacterial contamination in the well or reagents that will produce some ATP signal, which should disappear after a few hours. Again, the wait may not be necessary if there is no contamination. (The note in step 3 about waiting a few hours should probably be at the start of step 3. There is no need to wait a few hours AFTER reading data A). 3. What is the best sample preparation protocol for pancreatic islet cells? I recommend incubating each islet sample with 50ul of the Nucleotide Releasing Buffer, incubating for 5 minutes at room temperature with gentle shaking, and then adding this mixture to the ATP Monitoring Enzyme and Nucleotide Releasing Buffer mixture in the assay plate. 2) If possible, use ~1,000 cells per well. If you can do a seeding density curve, you will notice that the ATP/ADP ratio drops with increasing cell number. This is due to glucose depletion for the media. Less cells will give you a better charged cell. 3) Following on from point 2, change the media 1-2 hours before starting your experiment. This will replenish the glucose in the media. We found this to be very important when trying to utilise physiological glucose concentrations (2.5-10 mM glucose). Reliable kit and easy to use. The protocol for this kit states to read the sample in a luminometer after about 2 minutes. Is it possible to wait longer (eg. 10 minutes), or will the signal fade quickly? The signal should be fairly stable as long as the sample is protected from light. But we suggest measuring after 2 mins to make sure that no light is quenched. Waiting for 10 mins is not advisable since some light can be quenched during this time. For the specific samples in question, if there is no significant light by 2 mins, then most likely more sample should be used in the well. 1. Prepare a single cell suspension from the tissues of interest with any method desired (cells have to stay intact). Then treat the cells as instructed in the protocols section for adherent cells: Remove culture medium/ buffer and treat cells with 50 μl of Nucleotide Releasing Buffer for 5 minutes at room temperature with gentle shaking. Transfer into luminometer plate. (page 8, 4b). 2. Chop the tissues to the finest possible size (keep cool). Then treat cells with 50 μl of Nucleotide Releasing Buffer for 5 minutes at room temperature with gentle shaking. Transfer into luminometer plate. Please note that the tissue preparation needs to be optimised by the end user since an increased number of dead cells may affect the results. I would like to investigate the ratio of ATP:ADP in nerve tissue, namely DRG and saphenous nerve. Could you please advise whether this kit would be suitable and if extra steps are required? Diguet N et al. Muscle creatine kinase deficiency triggers both actin depolymerization and desmin disorganization by advanced glycation end products in dilated cardiomyopathy. J Biol Chem 286:35007-19 (2011). 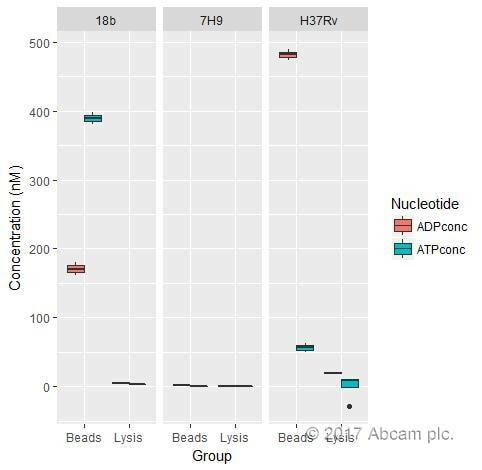 ATP and ADP/ATP ratios were measured using the bioluminescent ADP/ATP ratio assay kit from Abcam as indicated by the manufacturer with minor modifications. Briefly, cardiac tissue was frozen in liquid nitrogen and powdered with a mortar. Tissue powder was suspended in the provided lysis buffer (10 μl/mg of tissue powder) for 5 min exactly at room temperature, followed by centrifugation at 10,000 × g for 1 min to pellet insoluble material. We used 50 μl of supernatant per assay in a final volume of 100 μl. Luciferase units were converted to picomoles of the amount of ATP by plotting against a standard curve with serial dilution of ATP. Data were normalized by the amount of protein present in the supernatant as measured by the Bradford assay. I need to measure heaptic ATP, ADP, and AMP. Any suggestion? I am happy to confirm that ab65313 can be used with mouse liver tissue samples. This kit can be used to measure the ADP/ATP Ratio, AMP is not measured. If you are planning to use this kit with tissue samples, I would like to note that the preparation of the samples need to be optimized according to the sample type etc..
A single cell suspension has to be prepared from the tissue and this can then be treated as the adherent cells in the prototocol. Another possibility is to cut the tissue in very small pieces and then incubate for 5 minutes at room temperature in Nucleotide releasing buffer. I hope this information is helpful and wish you good luck for your results. I see that the readout would be ATP in the media; this means that non-viable (or dead) cells would have lower ATP readings in the media compared to live cells. Yes, you are correct. Lower ATP readings would indicate a decrease in cell viability. Can you please suggest a product for which I can test cell viability using cell supernatants? Ab65314 is recommended for cell viability. For media, use the same protocol as mentioned for the suspension cells in step 2.a.